These are the original Glenn Cronkhite-designed bass guitar bags. Some of the original bags are still in use today! Made in the USA using only the finest “Top Grain” leathers and durable 1000D genuine Cordura fabrics, you can be assured that your bass is well protected in a well made bag. NOTE: Most Cronkhite orders are cut and sewn after the order is made. If you need a rush, be sure to check with us first. The exterior is made from either a top quality leather, or the best US-made genuine Cordura fabrics. One Taylor AB2 Acoustic Bass Guitar. One side pocket for convenient storage. One 2 inch wide shoulder strap. This is the original Glenn Cronkhite design! At 5 pounds, you can’t go wrong! We use only the finest top grain leathers. Choose from smooth or pebbled black, a deep chocolate brown, cinnamon, or a stylish British tan. Our nylons are US-made genuine Cordura, which is one of the most durable fabrics ever invented. It’s abrasive strength is unmatched, and is almost always considered “Military Spec,” when others aren’t good enough. Students and professionals who want the original (and still the best!) 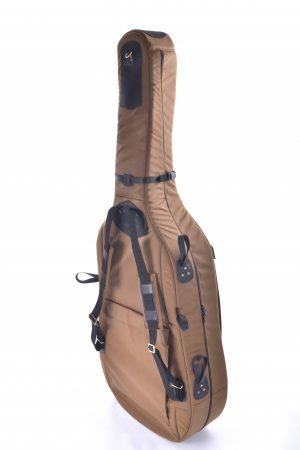 gig bag for carrying one Taylor acoustic bass guitar. These are the original Glenn Cronkhite-designed bass guitar double bags. Some of the original bags are still in use today! 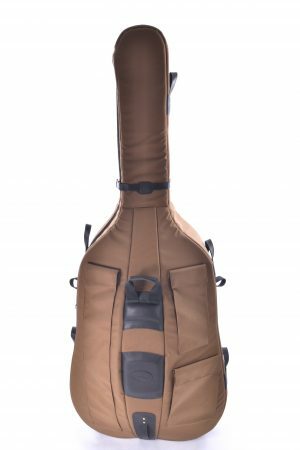 Made in the USA using only the finest “Top Grain” leathers and durable 1000D genuine Cordura fabrics, you can be assured that your basses are well protected in a well made bag. These are the original Glenn Cronkhite-designed upright (double) bass bags. Some of the original bags are still in use today! Made in the USA using only the finest “Top Grain” leathers and durable 1000D genuine Cordura fabrics, you can be assured that your bass is well protected in a well made bag.